Hastur is a member of the Cthulhu mythos created by famed horror author H.P. Lovecraft. Hastur is mentioned in Lovecraft’s story, “The Whisperer in Darkness. Hastur’s original creator was Ambrose Bierce, who wrote the short story “Haïta the Shepherd” and described Hastur as the God of Shepherds. Hastur is also known as Hastur the Unspeakable. Hastur is also the name of a city in the Robert W. Chambers, “The Yellow Sign” and “The Repairer of Reputations” , both of which are from the collection, “The King in Yellow”. H. P. Lovecraft read Chambers’s book in early 1927. H.P. Lovecraft included elements of Chambers’s work it to his own creations. Hastur was later developed into a Great Old One, spawn of Yog-Sothoth, the half-brother of Cthulhu, and possibly the Magnum Innominandum. Hastur has several Avatars: The Feaster from Afar, a black, shriveled, flying monstrosity with tentacles tipped with razor-sharp talons that can pierce a victim’s skull and siphon out the brain. 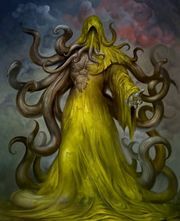 Hastur is also known as The King in Yellow. The Unspeakable One, Him Who Is Not to be Named, Assatur, Xastur, H’aaztre, or Kaiwan, The King in Yellow. If your interested in Hastur and Cosmic Horror you might interested in my book Cabals of Blood. 99 cents for a limited time! Cabals of Blood is a collection of Lovecraftian Horror. You’ve said his name more than three times now. I hope you didn’t read this blog post aloud. Grabbed a copy from Amazon. I’ll look forward to reading it. I enjoyed reading the collection of Chambers’ horror stories, The King in Yellow (Dover Publications, paperback) some years back. Chambers had a talent for writing, but is not widely known to current readers. Yeah. I found Chambers’s writings after delving deep into the mythos.